Partly cloudy with isolated thunderstorms developing late. Low 57F. Winds SSE at 10 to 15 mph. Chance of rain 30%.. Partly cloudy with isolated thunderstorms developing late. Low 57F. Winds SSE at 10 to 15 mph. Chance of rain 30%. 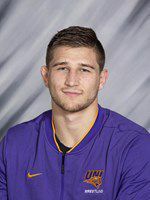 University of Northern Iowa national champion Drew Foster has been named the Big 12 Conference wrestler of the year. The Burlington native and Panther senior defeated sixth-ranked Max Dean of Cornell 6-4 to capture the 184-pound NCAA title in Pittsburgh to cap a 28-5 season. Foster also won his second Big 12 championship and posted 10 wins over top 20 opponents during the season. University of Northern Iowa shortstop Sammey Bunch was named Missouri Valley Conference Player of the Week Monday. Bunch homered in all three games of a weekend series at Illinois State and finished 6-for-11 with five runs scored and six RBIs. She has homered in five straight games overall and leads the MVC with 13 round-trippers and a .444 batting average. Leading scorer Emil Ohrvall was voted as Most Valuable Player by his Waterloo Black Hawks teammates as the club announced hits 2018-19 awards. Ohrvall leads the team with 63 points and 31 goals and his four hat tricks are the most by a Waterloo player in one season in 25 years. Kyle Haskins was recognized as the team's Most Improved Player, James Marooney and Griffin Ness shared the Community Service Award, Hank Sorensen earned the Front Office Player of the Year award, rookie Wyatt Schingoethe was Fan's Choice Player of the Year and radio announcer Tim Harwood received the Karen Wente Distinguished Service Award. The Salvation Army's Waterloo Salvation basketball program will host a junior varsity and varsity AAU basketball tournament Sunday at Waterloo East High School. The tournament is expecting teams from Cedar Valley Christian, Charles City, Denver, Dubuque and Marshalltown. Doors open at 11:30 a.m. with the first games tipping off at noon. Admission is $7 for adults and $5 for students with children 5 and under admitted free. Waterloo Salvation 16-under is 6-5 on the season while the 17-under team is 6-2. Several former University of Iowa basketball stars are expected at Mason City High School Saturday, May 4, to play in a fundraising event for former Hawkeye Kenny Arnold. Jeff Horner, Greg Brunner, Matt Gatens, Mike Henry, Vince Brookins, Michael Payne, Todd Berkenpas, Clay Hargrave, Waymond King, Jacob Jaacks, Adam Haluska, Jarryd Cole and Josh Oglesby are among those expected, as well as for Hawkeye football great Chuck Long. Doors open at 6 p.m. with a game against a Mason City High alumni team at 7 p.m. Tickets are $5 while raffles and auction items will also be available. Players will sign autographs and pose for photos after the game. Arnold was a standout guard for Iowa, including the 1980 Final Four team. He was diagnosed with brain cancer in 1984 ans has been fighting health issues ever since. The University of Northern Iowa volleyball program's Spring Tournament is set for Saturday at the Wellness and Recreation Center on the UNI campus. The field will feature UNI, Iowa State, Iowa, North Dakota State and Western Illinois. Matches begin at 9 a.m., and admission is free. Seating is limited, so spectators are encouraged to bring folding chairs.